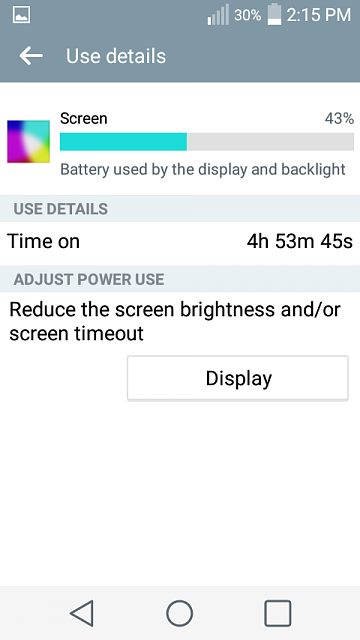 [LG Sunset] New to Android Phone - WiFi turns on occasionally without warning - WHY? Hello. I just got an LG Sunset and have noticed that my WiFi turns on occasionally without me actually doing it. I live in a rural area and have a limited WiFi connection for my home computer, and have turned off both data and WiFi on the phone so as not to use my WiFi data allotment up. I have noticed that twice now the WiFi just turns itself on and I have to turn it off to stop it. I can't tell why it is doing that or what is causing it to just turn on. I did get a message that updates were pending - which I can't do until I am where there is a public WiFi connection - could that be what is turning on my WiFi? And once I am where there is public WiFi - how can I then do those updates - I don't see that notice anymore and it just said 18 updates pending - didn't tell me which they were. Hi & Welcome to Android Central! Do you see an option in wifi settings, (mine i have to goto "advanced settings" within my wifi settings. I have one that I can check/uncheck for, "Let Google Location Service and other applications scan for Wi-Fi networks, EVEN WHEN WIFI IS OFF." Make sure that's off, as well as anything else relating to "auto-connect." Hope this helps! Keep checking back, as someone familiar with the Sunset may chime in. Also, don't forget to register for our forums, its free & easy! Welcome to Android Central! Agree with H3aTeRzz (man, that's hard to type! ). Also, check to see if there are any carrier apps installed--sometimes the carrier preinstalls its own app that might have some control over wi-fi. Hi Chris and thanks for the reply. I have checked the Location section on my phone and the Location Service is turned off - I believe it was when the phone connected, so that isn't it. I do see that there is a WiFi Optimizer page in the Tracfone App - this is on the Tracfone service. That gives me three choices - one of which is checked called Optimize WIFI management and there seems to be no way to turn that off. I guess I need to try to access that app and see if I can make changes. The choice Disable WiFi Management can't be selected. Maybe deleting that app is the way to go as I can get my usage by sending a text message. Maybe I'll try that and see if it stops the automatic connection. The LG Sunset is an LG L33L 4G phone. 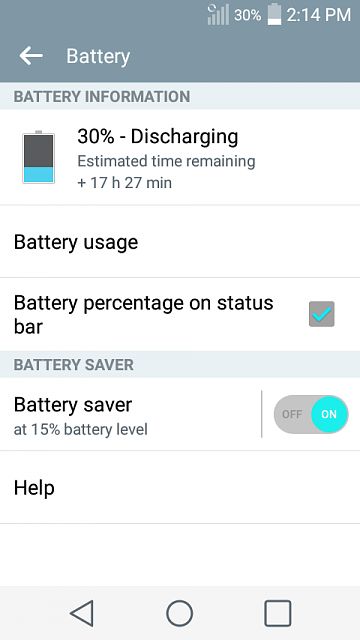 Seems to have lots of things to figure out about - but the battery also seems to be discharging fairly quickly - with little use and the phone on standby, the battery still drops to about 50% in 24 hours. In just the 15 minutes it has been connected, it has gone from 97% to 92%. Does that sound normal? Again, thanks for the info - this forum looks like it will be very helpful as I figure out the many ins and outs of this phone. Those wi-fi "optimizer" apps are often a pain in the behind. If it came with the phone, you probably can't uninstall it--but you might be able to Disable it. Go to Settings>Apps>All, look for Wi-Fi Optimizer, and tap Disable if possible. I actually did delete the app that seemed to be causing the issue and so far so good - I haven't seen anything try to access my home WiFi since I did deleted it, but I'm not quite ready to close the book on it. I will post some battery stats once it discharges to around 20-30%. (Not sure I have everything you listed in Battery). I charged it to 100% last night and it is down to about 88% now. I didn't "do" much with it today, but I was in a new area for this phone, so I was seeing how the signal strength was and if there were public WiFi spots - so it was seeking Wifi while we were driving. Thanks for the help and hopefully the WiFi Optimizer that was in the Tracfone App was the culprit and that's gone, so it all should be OK - at least for the moment. Not sure this will work - LOL! Thanks for any thought or if this seems normal! They're not quite what I was looking for--it's ideal to see the whole battery graph from 100% down to 20-30%, so we can see what the cell signal strength has been like and what the awake time has been. But I can tell from the high Cell Standby battery usage (and the fact that 5% of the time you didn't even have any viable signal) that your cell signal strength is often poor. This can contribute to battery drain, since the phone is struggling to maintain a signal. Thanks for taking a look. I don't see a way to actually display the entire graph - would I need to try several screenshots? I can wait till it gets to 20-30% and try it again. As to signal strength - we are in a spotty area and there is sometimes not a great signal, but that would also explain the battery not lasting as long as I had hoped. Though - no signal for 5% of the time over the course of nearly 2 days isn't as bad as it seems to me that it is - LOL! Thanks again - your help is much appreciated! Though - no signal for 5% of the time over the course of nearly 2 days isn't as bad as it seems to me that it is - LOL! 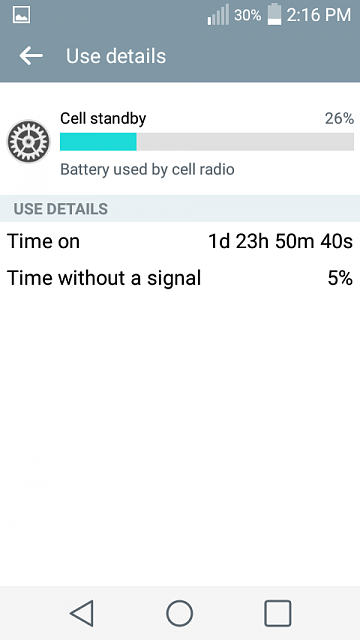 Remember that it's not just zero signal that causes battery drain--it's poor signal. If you have lousy signal but still some sort of connection, it won't be reported as Time Without Signal. You could have 0% Time Without Signal and still have massive battery drain if the phone always has 0-1 bars. Not all phones have the fullscreen battery graph showing cell signal strength. 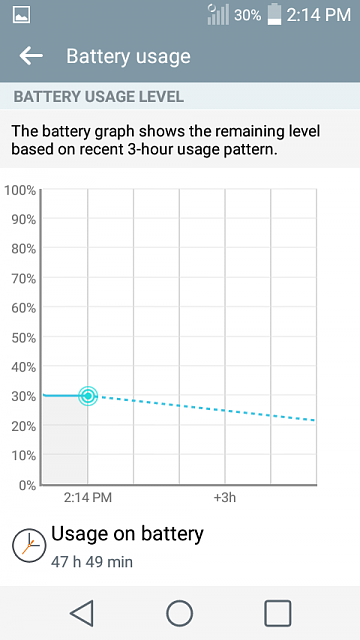 Go to Settings>Battery​ and tap the graph--does it show you the fullscreen graph? If not, you could install a 3rd party battery monitor app like GSam Battery Monitor. So - if I am in a low signal area and not using the phone, is it better to just turn it off to save the battery? What is considered an adequate signal - 3 bars? My battery graph doesn't display the full screen. Tapping on it doesn't do anything - but I can scroll it back and forth to see more. Thanks again for the information and help. Guess I need to just get used to how long this phone will last between charges. My old one was great - it was easily a week or more in the same poor signal area. If you're in a low signal area, you could turn on Airplane Mode, which turns off the cell radio. You could still turn on wi-fi afterwards to access the web (and you could make calls over wi-fi using Hangouts Dialer or something similar. It's hard to say how many bars is too low, because different phones will have somewhat different signal-reporting algorithms or software. But in general, if your phone is showing 0-1 bars, it might be worth turning on Airplane Mode. Airplane mode - good tip! I may also look into some type of wi-fi calling. Thanks again for all of the help and suggestions! Why won't my S6 sound stay on vibrate/silent after the Marshmallow update?